Mamma (pronounced "Mam-maw”) Jolly was my paternal grandmother who was one of those dear, wonderful ladies God creates just to make the world a nicer place to live. Memories of Mamma are as sweet as her desserts. Preheat oven to 300 degrees. Sift flour into mixing bowl. In a copper or stainless steel bowl, beat egg whites to soft peaks; add salt when whites are just foamy (add cream of tartar at this point if using a stainless steel bowl). Gently fold in sugar and lemon zest with a rubber spatula; fold in flour in two batches. When everything is completely incorporated, transfer batter to angel food cake pan and smooth the top. Bake until cake is a pale brown color and springs back when gently touched with a finger, and when a skewer inserted in center comes out clean (about 1 hour). Cool upside down on an RC Cola (Mamma pronounced it "Aura-See” Cola) or a 7-Up bottle. 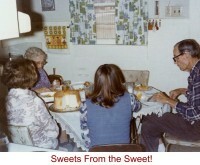 Search for Desserts articles similar to "Mamma Jolly's Angel Food Cake. Search all articles similar to "Mamma Jolly's Angel Food Cake".